PR: How did you get discovered? We hear that you took initiative and sent photos to your mother agent. JULIER BUGGE: Yes, I talked to my friend, who told me to try to send some photos to 1st Option, and so I did. They called me the next day and asked me to come and meet them, and right after that I signed the contract. I wasn’t really nervous, I didn’t have any expectations if they would call me back or not. I didn’t want to hope for anything. PR: What were you doing before modeling? JULIER BUGGE: I was working at a café in Copenhagen and thought that it was pretty boring. I wanted to be a model when I was like 13 years old, but I wasn’t allowed by my mom and dad until I was 16, and I am so happy that they made that decision for me. It wasn’t until I was 18 years old I tried because of my friend who told me to send some pics. PR: If you could follow the career path of any model, whose would it be? 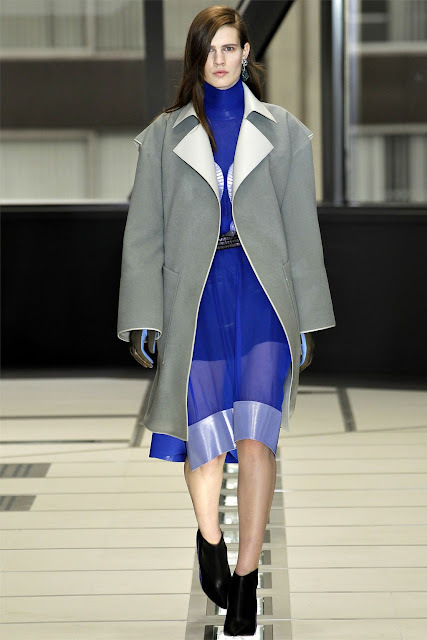 PR: Balenciaga campaign and runway exclusive! What do you own by Balenciaga? JULIER BUGGE: I was allowed to go and pick some stuff from their closet, so I have got my very own Balenciaga bag, one dress, one blazer jacket, a t-shirt and a shirt. Love it all! PR: What was it like opening the runway (FW12) show? JULIER BUGGE: It was pretty crazy, actually I didn’t realize it for days. I still think that I haven’t really realized it yet. But it was very exciting to open the show and be able to follow the collection for the month that I was working with them. They are amazing people. PR: What would you have done if you had fallen? JULIER BUGGE: I think I would try so hard not to laugh and be really embarrassed. Try to stand on my feet again and try to look cool. PR: We hear that you are quite a music buff. What would you say are your top three songs – but here is the catch – of Danish production? JULIER BUGGE: Oh no I don’t really hear any Danish music, not new Danish music anyway. And I don’t have favorite songs, only bands. I think it will have to be D-A-D, their old cow punk. Then there is Sort Sol and Superheroes. But my favorite musician in the world is my boyfriend! PR: How important is music for you when you are on location – shooting? JULIER BUGGE: It depends on what’s being played of course. But you get more energetic with music on set, and that is pretty nice. But if it’s good music I need to concentrate not singing along. PR: LOL. Tell us about the most memorable concert! JULIER BUGGE: I’ve seen many really really good concerts. The Strokes of course (my favorite band), I’ve seen them twice on Roskilde Festival. Then there was Hank3 on Roskilde also, that was insane. So much fun! And I’ve seen Rufus Wainwright two times in Copenhagen, he’s amazingly good. I think those are some of the best things I’ve seen. Oh and Kings Of Leon of course!!! PR: If you could meet anyone, dead or alive, from the music industry who would you meet? JULIER BUGGE: Hmm let’s see. I’ve already met Julian Casablancas and Albert Hammond Jr. of The Strokes, I would like to meet them again. But I Think I would pick someone else, Michael Jackson would be obvious, or maybe David Bowie. JULIER BUGGE: I’ve been to Roskilde Festival this year, it was awesome. It was my 7th year to be there, so It’s pretty much a tradition by now. But this was my best year so far. PR: What are your must haves in your bag? JULIER BUGGE: My Ray Ban aviators. I can’t live without sunglasses and they are the perfect pair. My iPhone is a must (because of the music on it), my cigarettes and my wallet. I don’t think I need more than that. Well yes sun-lotion when it’s really sunny. PR: What are your favorite locations for shopping in Denmark? JULIER BUGGE: My favorite has to be Episodesecond hand clothes. I don’t really shop much, but this one is cheap and has great, funny and cheap clothes. PR: If you could rummage through anyone’s wardrobe, whose would it be? JULIER BUGGE: David Bowie, back in the days! PR: What makes you feel glamorous? 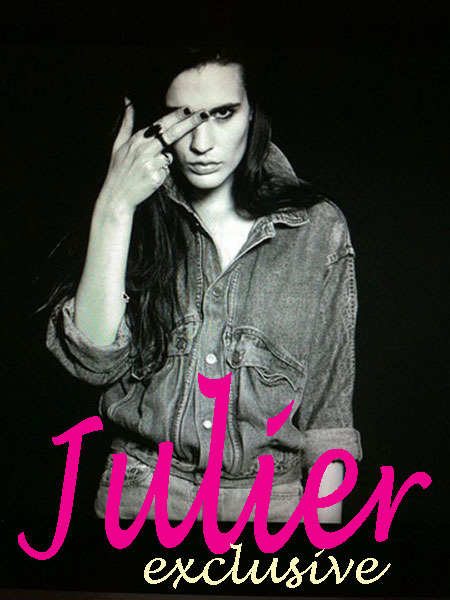 JULIER BUGGE: When I wear heels and a dress, I don’t do that very often. JULIER BUGGE: I don’t really have that, I just hit the shower and then I’m out the door. JULIER BUGGE: I only have a powder and a consealer. PR: Do you have a signature scent? JULIER BUGGE: I have never been working out in my life, but I just started in a fitness center, not because I need it, just for fun because I love the machines there. PR: Can we see you often driving a bike around? JULIER BUGGE: I only bike in the summer, but in the summer I ride it everywhere. I don’t know what kind my bike is, but it’s purple and shiny. JULIER BUGGE: I have been a vegetarian for 6 years. But in may I turned back to meat again. I was in Mallorca and my boyfriend ate a steak, it looked so good that I just had to try it! Now I eat everything but pig. My favorite is steak!!! And I’m not on any diet or anything. I love cake and candy too much. JULIER BUGGE: Yoghurt, fresh fruit and granola. Had my best one in Chicago two years ago! JULIER BUGGE: No what’s that? PR: Bubble Tea! We also heard about Danish movie “En kongelig affære”. Is it worth seeing? JULIER BUGGE: I don’t know, I’ve never seen it haha!